South Korea scrubbed a second attempt Thursday to send a research satellite into orbit when engineers detected a problem in the rocket's steering system shortly before liftoff. The countdown halted about 17 minutes before the rocket's scheduled launch at 0700 GMT (2 a.m. EST), and Korean space officials told reporters the mission would not go forward Thursday, according to South Korea's Yonhap news agency. Officials have not announced a new launch date. The Korea Satellite Launch Vehicle was expected to launch on its third mission and place a 200-pound Korean satellite in orbit. 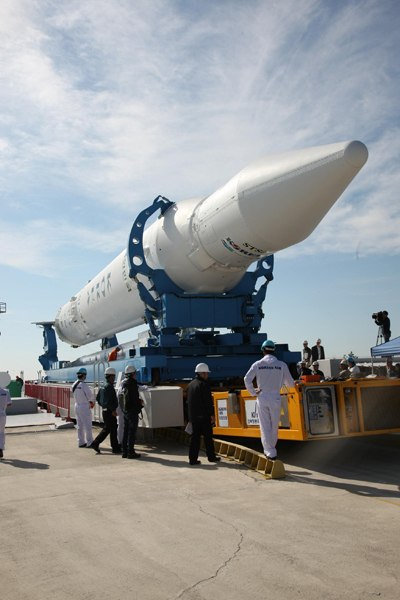 If successful, it would mark the first successful space launch from South Korean territory. Two KSLV flights in 2009 and 2010 ended in failure. Russia's Khrunichev rocket contractor built the launcher's first stage, and the Korea Aerospace Research Institute provided KSLV's solid-fueled upper stage, which is designed to inject a small satellite into orbit. The 108-foot-tall KSLV 1 rocket is supposed to lift off from the Naro Space Center, a facility about 300 miles south of Seoul in the South Jeolla province near the southwestern tip of the Korean peninsula. The KSLV's first launch attempt Oct. 26 was cut short several hours before liftoff after officials detected a fuel leak. The mission was put off more than one month as South Korea awaited delivery of a rubber seal from Russia to replace a faulty part connecting the rocket's first stage to the launch pad. Yonhap reported the cause of Thursday's scrub was a problem in the thrust vector control system of the rocket's Korean-built second stage. The thrust vectoring system is designed to steer the rocket during the last phase of launch sequence. At the time of the scrub, the KSLV's first stage was filled with kerosene and liquid oxygen propellant. According to a joint statement released by Khrunichev and the Russian space agency, the KSLV will be removed from the launch pad at the Naro Space Center as officials determine how to fix the glitch. Khrunichev said a part on the second stage will need replacement. "The launch vehicle is being removed from the pad to be rolled back to the technical complex for fault correction," the Khrunichev statement said. Moving the rocket back to its hangar means launch must be put off at least three days, based on prior statements from South Korean officials. South Korea has spent about $471 million on the KSLV rocket program since 2002, according to Yonhap. Russia's contribution, which includes the first stage structure and a kerosene-fueled RD-151 main engine, was defined in a contract signed with South Korea in 2004. The first stage is a prototype for Russia's Angara launcher, which is scheduled to launch for the first time in 2013. Russia is developing several versions of the Angara to carry a range of satellites to space. The RD-151 engine is a smaller version of the engine used on Zenit and Atlas rockets. The third launch of the KSLV 1 rocket is reportedly the final planned flight of the booster. South Korea plans to develop an indigenous rocket and conduct its first launch by 2022.